Prepare a 12 cup standard muffin tin with muffin papers or a generous coating of cooking spray. In a large bowl, sift together the flours, baking powder, baking soda and salt (if using). Sifting these ingredients together - instead of just stirring - will give you lighter, fluffier muffins. In a separate large bowl, lightly beat the egg. Add the mashed bananas, sugar and butter. Mix until well-combined and smooth. Add the wet ingredients to the dry ingredients and mix gently with a wooden spoon until just mixed and moistened. Fold in the chocolate chips. Scoop the batter into the prepared muffin tin, filling each cup about 2/3 full. Bake for 15 to 20 minutes until the golden brown on top and a toothpick inserted into the center of a muffin comes out dry (no batter). Tip: If you have bananas that are getting soft and spotty, don't throw them away. Just throw them in the freezer. 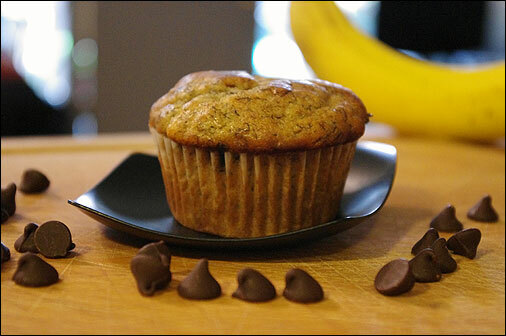 When you're ready to make muffins, just defrost the bananas in the microwave until cool and soft. Peel them. Mash them. Make great muffins. Banana and chocolate chips taste so good together. This is an easy recipe for moist and tasty muffins. A great way to use up over-ripe bananas. Recipe number 2858. Submitted 6/14/2010.